Sarkarai means sugar in Tamil but the Pongal prepared is nothing to do with the sugar but with vellam (jaggery) only. Take a KadAi (wok, iluppaichchatti/vANali) and roast the mung dAl till it becomes golden colour and releases nice smell. 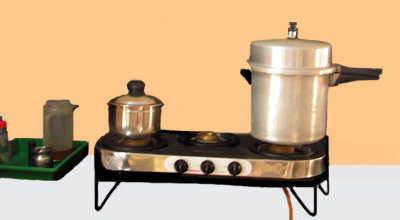 Cook the roasted dAl with raw rice together with 3 cups of water and 1 cup of milk in a vessel in the pressure cooker. For new raw rice, the water should be only 2 cups. After the cooker lets out 3 to 4 whistles, switch off the flame and after a few minutes when the pressure has come down in the cooker, remove the contents and mash them well with a ladle as to allow the ingredients mix well instead of remaining distinctly separate. Now boil the gur in a kadAi adding a cup of water. After it boils for a few minutes strain it to remove sand and other impurities. Take the strained liquid and boil well till it thickens lightly. Add the cooked rice dAl mixture to it and mix well without any lumps. After a few minutes when all the contents form a semi solid product remove the kadAi from the stove. Now fry the cashew nuts and raisins separately. To it add the cardamom and nutmeg ground separately already. Mix again for a second and add the ghee to this. Mix again once and remove from the stove. Note: Some prefer to add coconut shreds also to the pongal to enhance the taste. If you like, you can add the shreds either to the strained gur syrup or fry with a little ghee for a few seconds till it becomes golden brown and mix. Some like to add edible camphor but it is not advisable to do so since it produces giddiness. 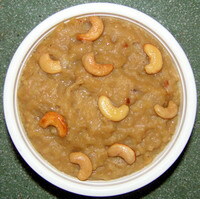 * The above recipe is for the Pongal Pandikai neivEdhyam. For other occasions you need to replace milk with plain water. I always prefer uruNdai vellam (spherical gur/jaggery) as it is stickier than the small achchu vellam (moulded gur/jaggery). In case larger pieces or moulds are available, then break the large pieces into comfortably smaller pieces in advance and store them in a container tightly closed for ready use. This saves time in breaking every time you need a small quantity for pAyasam, sarkarai pongal etc. This entry was posted on February 17, 2011 at 11:08 pm and is filed under Pongal with tags camphor, cardamom, cashewnut, coconut shreds, dAl, dhal, ghee, Gud, gur, jaggery, kadai, milk, mung, nutmeg, payasam, Pongal, raisin, Sarkarai, strain, vanali, vellam. You can follow any responses to this entry through the RSS 2.0 feed. Both comments and pings are currently closed. Yummy recipe Amma!! The description itself is mouth-watering.. Nice start to the recipe corner.. Will try it out soon..
Nice amma.I feel like eating pongal again .Iam gonna make it this weekend and eat again. Thank you!Had you been here I would have given what I made! Sure, I will be very much pleased!